Raise your hand if you’ve been told on social media to go outside. Raise your hand if you’ve been told (on social media no less!) to put down your phone and make real-life conversations. YES, WE ARE ALL RAISING OUR HANDS. Who else is getting tired of this recycled advice? Because we get it! We hear you. We agree. We’re working on it. But hey, what about the things we can do to actively improve our interactions on social media? Shouldn’t we talk about those too? I came up with 5 simple things. There’s more, I’m sure. 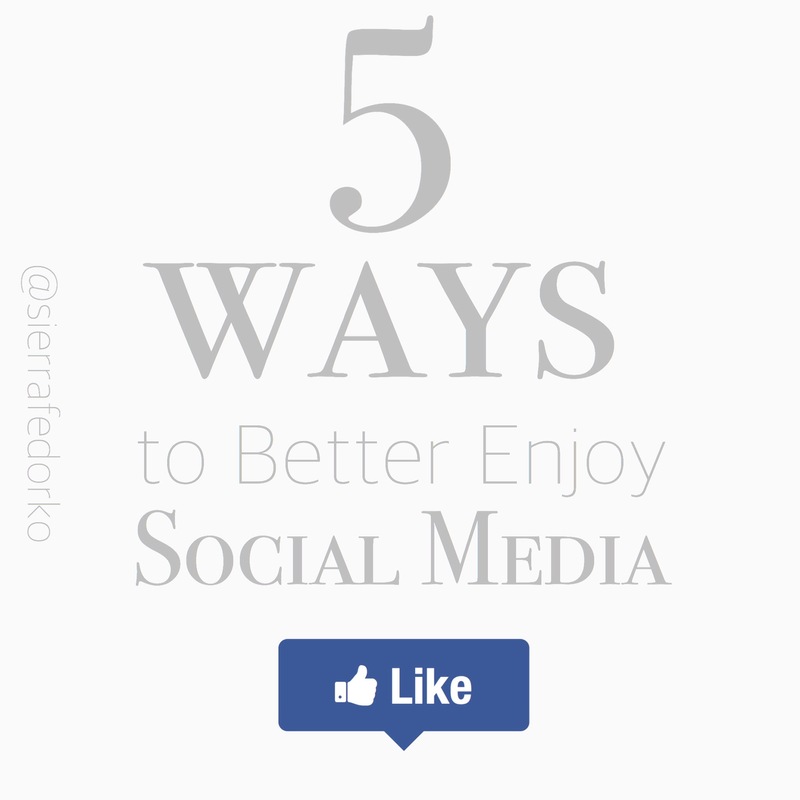 And I’d love to hear your tips in the comments, but for now 5 things that just might make your social media experience better! 1. Don’t scroll on any type of social media for an hour. This is one of the best things for you to do that will improve your social media interaction. Our minds were not meant to digest the information of 50+ people in one sitting. It will exhaust your mind, make way for comparison, and destroy 60 minutes you can’t get back. I find that a little bit of social media at a time helps me focus on the friends I’m reading about & allows me to share in their life for a few seconds. That’s about our tiny mindsY can handle. 2. Send messages to people. Don’t stalk people. If you really actually want to get to know someone, then message them. If you just want gobs and gobs of knowledge ABOUT someone with no intention of doing anything productive or kind with it, then DON’T DO IT! Use social media to make real-life connections. Don’t use it just to know stuff. 3. Care as much about her Instagram posts as you do about your own! Do you only use Instagram to build your story for others to affirm? If this is the case, you’re probably really frustrated with social media. Life is frustrating when we make it about ourselves. My advice? Care about your friends on Instagram by commenting, encouraging, complimenting, and interacting on their posts. You will enjoy social media so much more when you care about others more than yourself! Social media are excellent outlets to helps us BUILD community! We shouldn’t be using them to make ourselves into this great & mighty thing. Get out of your world and jump into hers! Be intentional in your interactions & enjoy the community that will spring from it. 4. Enjoy good times & life-changing moments completely before sharing them for the entire world to see. If I could go back, I would change how soon I made my engagement to Ben public. I wish I had taken at least a day to just quietly enjoy what had happened. It just goes to show that life events & good times don’t have to be shared lickety-split (newsflash: they don’t even have to be shared at all). I, for one, enjoy seeing what my friends are experiencing. By all means, please share with me! I beg you to take time to enjoy the moments privately before you share them publicly. This not only helps you make full memories, it also takes off the unnecessary pressure of how others will react to your news. It doesn’t matter what everyone and their brother thinks, just enjoy what’s in front of you. I think you’ll find that when you’ve taken time to personally experience the life moments, you will care much less about what others think about it. 5. Treat others how you want to be treated. Seriously, seriously, seriously! This is probably the biggest one and it will improve your social media interactions ten-fold. Don’t you love getting messages from people you care about? Go send one! Don’t you love when people share your artwork or your blog posts? Go share one! Don’t you love when people leave kind comments on your photos? Go comment! Don’t you love when people rejoice with you in those big life things? Go rejoice with them in their joy! Instead of waiting for people to notice you, notice them. By giving to them, you take your eyes off yourself. You begin to care less about how people will perceive you and you become a big part in a richer community. And shouldn’t we be using social media to strengthen our friendships? It can be used to build up as easily as it is used to tear down. Social media has the potential to be awesome…and profitable! I agree with it all. Especially limiting the time on social media. I use to cling to it. Then I realized everybody else is out living, so why don’t I? 30 minutes is just enough. Anything after an hour, I feel as if you just mindlessly scroll and all motivation to do anything else is long gone. Good article!